The domain youtube.com was officially registered on Valentines day in 2005. 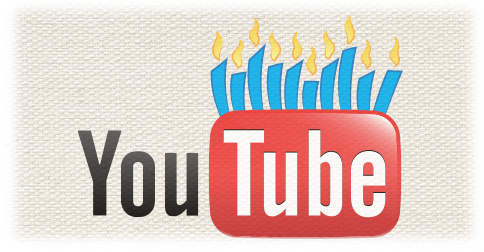 With that, YouTube has officially celebrated it’s 10th birthday this weekend. Initially started as a website for people to simply share video content, YouTube has grown into a global phenomena. A cultural behemoth, YouTube has changed our collective lexicon and impacted how people consume video content. From a digital perspective, 2004 was an interesting time. The first dot-com boom had passed. Web portals were in the decline, replaced by Google, search and SEO tactics. LinkedIn was a new networking site. Facebook, Twitter and “social media” (as we understand it today) didn’t exist. Cell phones were still mostly used for talking, but texting was rapidly rising. At the onset, YouTube faced daunting challenges. Video was difficult to use in a digital environment and it was complicated to create. Most websites didn’t feature video content. Most web users still faced bandwidth issues when accessing streaming video. Producing video content was complex. Integrating video content into websites required advanced programming skills. Yet, YouTube’s simple premise propelled it’s growth. Enabling people to watch or post online video has radically changed the media landscape. What we do producing videos to explain what companies do, would not be possible without YouTube. We’d probably still be designing posters, brochures, print ads and other static content as Adelie Studios was in 2005. Around 2007 we started to see the storytelling and engagement possibilities YouTube and online video was beginning to offer. Over the next year, we’ll look at YouTube’s impact on video and marketing. Exploring a different facet on every Tuesday. You can follow the hashtag #YouTube10, remember to check out the blog or any other day of the week for some other sparkling video marketing tips.